This Sunday’s blues session at the Hope Tavern in Holton le Moor introduces five piece band Storm Warning. Lauded by the UK blues press as one of the top contemporary blues rock bands in the UK, Storm Warning makes blues standards their own and superbly craft original blues songs. They play the blues with real feel, but rock hard enough when required. Their four CDs have all received critical acclaim and their tracks have been played on radio stations throughout Europe, the USA and the UK. 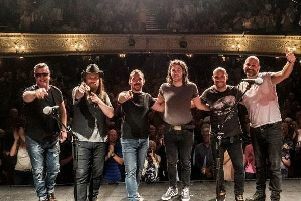 They have earned a reputation as one of the UK’s best and individual blues bands with the vocals and blues harp of Son Maxwell and the sublime guitar playing of Bob Moore, backed by Ian Salisbury on keys, Derek White on bass and drummer Russ Chaney. The show starts at 4.30pm on January 21; door charge is £8.